Tax season. It’s that wonderful time of year when we pay another person to tell us how much of our money we will then have to pay out in taxes. It’s like a reverse Christmas. I’m not a fan, and I know you’re not either. There IS a silver lining, however. 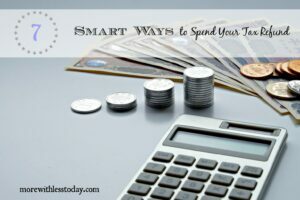 Tax season usually means a tax refund and there are some smart ways to get the most from your tax refund and get ahead. There are several smart ways to get the most from your tax refund. Tax refunds can be used for everything from getting ahead on bills to taking a trip. Here are a few of my picks for making the most of your refund this tax season. 1.) Savings: If you’re all set with the rest of your finances, a great way to use your tax refund is putting it into savings. It’s like having mad money for your future security. When that refund check comes in this tax season, just deposit straight into your savings account or investment account. Out of sight and out of mind. We all should have at least 6 months of living expenses saved. 2.) Bills: If you’re behind on your bills or if you have a large expense coming in the near future, why not use your tax refund to knock it out immediately? Instead of worrying about the bills you have or the bill that’s coming, just use your tax refund to solve the problem in one fell swoop. Think of the interest you will save. 3.) College Fund: Start or add to a college fund. Trust me on this one. My daughter just finished her master’s degree and the applications, test prep and books are enough to make you cry. Nevermind the tuition. Save, save, save, and start early! 4.) Home Renovation: Home renovation is another great way to find the silver lining in tax season. That refund will make an excellent down payment for renovating or repairing portions of your home that have been neglected. 5.) Your Health: Money spent on taking care of your health is money well spent. Have you been putting off out of pocket costs for health care or dental care? Too busy to go to the gym? Think about spending your tax refund on something that will help your health. C’mon now, being sick is expensive! 6.) Vacation: Maybe you’re all caught up on your bills, and your savings is moving right along. In that case, why not use your refund for a nice family vacation. I can’t think of a better silver lining to tax season than a nice trip with the family. It’s a great way to really bond together and make a memory. 7.) Buy a Reliable Car: If your car has just about had it, and you have spent too much money keeping it running, consider using your tax refund to get another one. Find a reliable used car and have it checked out by a mechanic right away. Last year, we bought a hybrid car (Ford C-Max Energi) which we love and we got a tax credit too. I love the savings on gas and the reliability. We had two old cars and one of them was always in the shop. Although I dislike having a car payment, the gas savings and the lack of repair bills has more than made up the difference. For us, it was a smart way to spend our tax refund. Whether you want to save, renovate, splurge, or replace your worn out car, you can use your tax refund to help make it happen this tax season. While I’ve never looked forward to tax season, I’ve always been a fan of using my refund to help me get a little extra done. Hopefully this list of ways to use your tax refund will help you find the silver lining in tax season, too. Are you on Pinterest? Follow More With Less Today on Pinterest for more ideas.